For many of our corporate partners, fighting hunger goes beyond simply writing a check. Our friends at Valley National Bank visit the FoodBank often, both as volunteers and in support of our Food Service Training Academy (FSTA), which they generously fund to help provide a better future for our neighbors in need. In August, Valley representatives joined us at FSTA graduation to see the impact of their contribution and to celebrate the graduates’ achievements with them. The team at Valley National Bank’s headquarters has also hired our Stone Soup Culinary Creations catering team for corporate events. 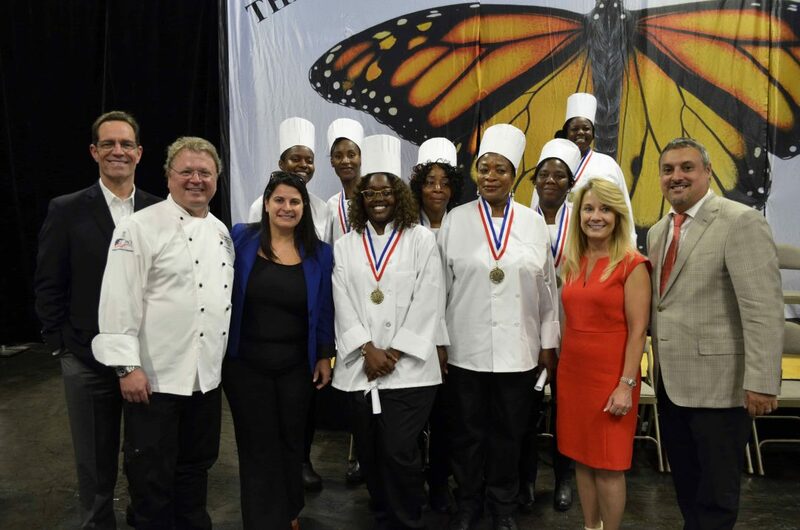 Headed by the FoodBank’s very own Chef Paul Kapner, the Stone Soup team includes classically trained chefs and FSTA students, providing those in need of a second chance with real world experience. All proceeds benefit the Food Service Training Academy and our neighbors in need. Valley volunteers are a welcome presence at the FoodBank, as well. Since becoming a partner with us, 47 Valley National Bank employees have donated more than 130 hours to help fight hunger in New Jersey. For more information on how your company can get involved, please contact Debby Scheinholtz, Director of Corporate Relations, at 908-242-3951 or dscheinholtz@cfbnj.org.